A group of Oakland business leaders and A's boosters wants to lease the Howard Terminal on the city's waterfront as it works out details to build a new ballpark on the site. 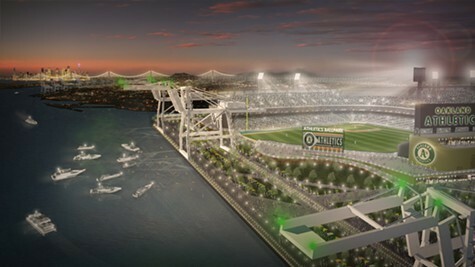 The group, which is calling itself The Oakland Waterfront Ballpark LLC, (OWB) sent a letter last week to Port of Oakland Executive Director Christopher Lytle, requesting that it enter into exclusive negotiations with the port in order to use the Howard Terminal for a "world-class" 38,000-seat facility. The January 15 letter was signed by business leaders Don Knauss of Clorox, T. Gary Rogers of Dreyer's Ice Cream, and Michael Ghielmetti of Signature Development, along with former planning commissioner Doug Boxer and San Francisco developer Seth Hamalian, who is planning to build a 28-story tower in Oakland's Uptown district. The group anticipates that it would need six months to three years to obtain the local and state approvals required to build the stadium on the site not far from downtown and to complete necessary environmental studies. Under terms of the proposed deal, OWB would pay the port $50,000 after the two sides enter into an exclusive negotiating agreement (ENA), and then would pay the port an additional $50,000 if the negotiations lasted beyond six months. During that time period, OWB proposes to work with the port and the city to examine the feasibility of building a ballpark on the 50-plus-acre site, which sits just west of Jack London Square. The proposed deal also would allow OWB to transfer the ENA to the owners of the A's — and potentially a new ownership group, should team owners Lew Wolff and John Fisher decide to sell the team. Wolff has said he has no interest in building a new ballpark at Howard Terminal. His options, however, appear to be limited to that location or to Coliseum City in East Oakland in light of a court ruling last year that effectively blocked his plan to move the team to San Jose. In addition, the Express reported last month that at least three potential ownership groups have expressed interest in buying the A's, including one led by Warriors' co-owner Joe Lacob, according to knowledgeable sources. OWB's letter to Lytle requests that he respond by February 6 to the proposal.